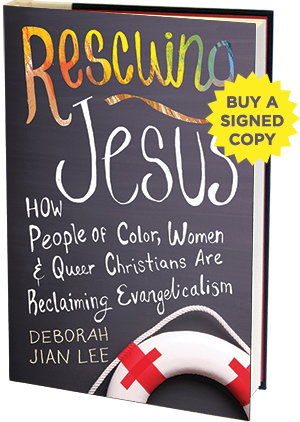 Backstory: In the summer of 2016, 53 communities across the U.S. and Canada read Rescuing Jesus as part of One Book, One Church a national, inter-church book club focused on developing concrete strategies for practicing radical inclusion and pursuing authentic social justice. Together with Urban Village Church, we are now extending the One Book, One Church experience to any community that wants to join at anytime from anywhere. This September we are launching One Book, One Church Anytime, Anywhere. Sign up today and you will receive the complete Rescuing Jesus curriculum kit for FREE. This includes an interactive discussion guide, webinars with the author and leading evangelical justice activists, theologians, licensed therapists, scholars and pastors, special invitations to future online events, exclusive news/updates and more. What’s the goal of One Book, One Church? The primary goal is to get your community to consider, pray about and participate in important justice issues impacting “the least of these.” Rescuing Jesus provides a starting point for this conversation, with intimate stories, history, studies and expert analysis that your community can discuss. The secondary goal is to build community and power across your church community and online. One Book, One Church will help your community expand its network and tap into resources that will help you develop concrete plans for your community to practice intersectional justice (more on this below). Anyone. We welcome you to invite your community, whether it’s a congregation, small group, book club, campus ministry or other group, to join One Book, One Church. What will my community get out of this? The short version: The Rescuing Jesus curriculum kit provides a safe, accessible starting point for communities to build understanding across different identity groups, forge healing conversations, create radically inclusive spaces and develop concrete strategies for faith-based engagement in justice work. The long version: Oftentimes we look at justice issues through a single lens, for example, combatting racial discrimination. But intersectional justice (one of the themes of Rescuing Jesus) states that justice issues cannot be dealt with independently; instead, those seeking justice must understand how various systems of oppression or discrimination interact with each other. But conversations about justice and intersectionality can often be filled with jargon, confusing ideas and fear of saying the wrong thing. This dialogue around the stories and research presented in Rescuing Jesus aims to create a safe space for people to learn and figure out how to get involved. What are different ways your community can get involved? People can discuss the book in their small groups with a discussion guide provided. People can watch and discuss online webinars about "Healing from Spiritual Abuse," "Identity: Learning to Love Who You Are," "How Can the Church Prioritize Intersectional Justice?" and more. People can join a conversation online where we will post articles and invite conversation. When does One Book, One Church start? Whenever you want it to. We've designed the Rescuing Jesus curriculum so that any community can join at anytime from anywhere. Want to schedule your book club to launch with the new school year? Want to schedule it around the election? Want to host a winter break book club? Go for it. We didn't want to limit the conversation to our summer book club, so now it's available for you whenever it works best for your community's schedule. But be sure to sign up! That way we know where to send the curriculum; also we'll keep you posted on upcoming events. I’d like to get to know Debbie better. Where can I read her past work or listen to hear past media interviews? Glad you asked! You can find interviews, media coverage and reviews of Rescuing Jesus here and more of her past writing here. How else can I stay tuned? Like our page on Facebook and join the conversation! What can you tell me about Urban Village Church? Urban Village Church is a Christian community that meets in four neighborhoods throughout Chicago. Embodying values of boldness, inclusion, and relevance, Urban Village’s mission is to create Jesus-loving, inclusive communities that ignite the city. Whether you are gay or straight, doubter or believer, conservative or democrat, you are welcome at Urban Village Church. Visit www.urbanvillagechurch.org to learn more. Contact Erin James-Brown, Director of Discipleship and One Book, One Church Ambassador, at erin@urbanvillagechurch.org.